Design in 3D with this DohVinci Peace Project kit! You can use the 4 Deco Pop tubes, Styler and add-on pieces in this set to decorate a beautiful peace symbol. Flowers and other fancy details are a snap – just aim, squeeze, and design to your heart’s content! Add the ribbons for even more flair. You’ll experience your imagination in gorgeous 3D with the Peace Project Design Kit. Design in 3D with this DohVinci Peace Project kit! 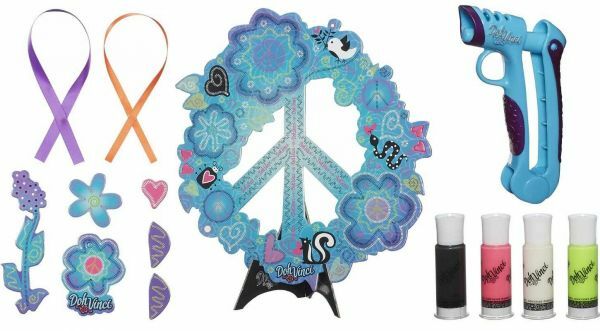 You can use the 4 Deco Pop tubes, Styler and add-on pieces in this set to decorate a beautiful peace symbol. Flowers and other fancy details are a snap – just aim, squeeze, and design to your heart’s content! Add the ribbons for even more flair. Includes peace sign project, Styler, ribbon, 4 Deco Pop tubes, add-on pieces and inspiration guide.